Make your bedroom the cosiest room in your home with underfloor heating. Benefits of Underfloor Heating in a Bedroom? A good night’s sleep is dependent on a comfortable and snug environment in which to truly relax and installing underfloor heating in your bedroom is a great way to improve the quality of your sleep. 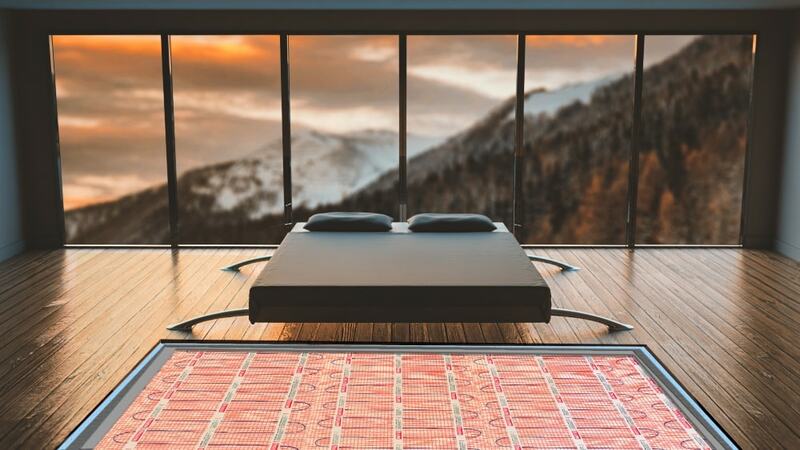 The need for even heat distribution and a comfortable room temperature make underfloor heating the perfect choice for a bedroom, creating an ideal environment to recharge in after a long day. Underfloor heating utilises radiant heat to gently heat the room to the desired comfort temperature from the floor up. This also has the added benefit of reducing dust circulation around your bedroom. Warmup heaters are controlled by our advanced thermostats which can also offer optimised, automatic heat control – meaning your bedroom is heated to your ideal temperature at exactly the right time for you, automatically. Floor heaters also offer greater design freedom, so you can enjoy more space in your bedroom without the inconvenience of accommodating radiators, baseboards or heat vents. 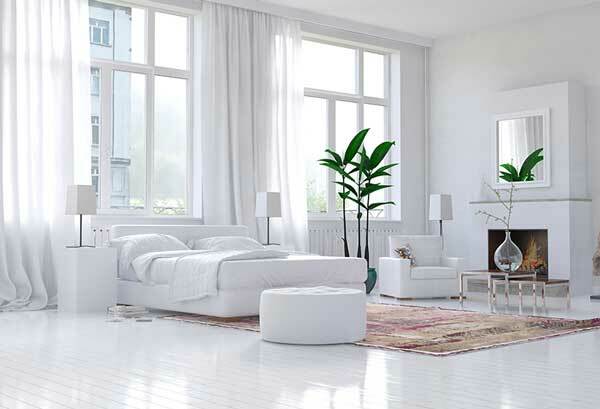 Our Electric Underfloor Heating Systems are perfect for Bedroom renovations. Warmup offer a wide range of electric heaters which are easy to use and quick to install by a qualified electrician. The Foil Heater is an electric system specifically designed for floating floors, like carpets and laminate. The Foil Heater suits larger, rectangular shaped rooms and provides a continuous earth layer within the floor construction whilst diffusing the heat away from the heating cable and into the bedroom. The StickyMat System is suitable for use with a variety of floor finishes and features a self-adhesive backing which provides rapid installation times. It also uses the thinnest heating wire on the market, meaning using this system will only negligibly affect floor build-up heights. If you are building a new home as opposed to simply renovating, we recommend you look at our Water Underfloor Heating Systems which offer low long-term running costs. The most used bedroom flooring material in the UK is traditionally carpet, closely followed by vinyl and laminate. Warmup offer a wide range of heating solutions suitable for use with all types of flooring finishes. See our Floor Coverings section to learn more. Warmup floor heaters have lower running costs than traditional central heating systems due to their radiant heat technology and greater energy efficiency. See our Running Costs Calculator to get an idea of how much it would cost to heat your bedroom. To get the most out of a floor heater we always recommend installing the system with Insulation Boards and a Warmup heating controller, which maximises the efficiency of the system. See below for an example of the cost of installing a 150 watt StickyMat System in a bedroom with a heated area of 10m2. The most used bedroom flooring material in the UK is traditionally carpet, closely followed by vinyl and laminate. Warmup offer a wide range of heating solutions suitable for use with all types of flooring finishes.